I've got a terrible cold at the moment and don't feel like writing any reviews. 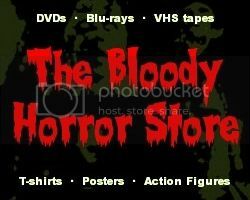 Rather than sit around doing nothing though, I decided to create "The Horror Movie Database". Obviously, I haven't added much to it yet other than 35 stubs for horror films from the 1920s and 1930s but this isn't something that's going to happen overnight. The idea will be that you can leave your review of each film in the comments section, links to your review on your own blog or whatever else you want. As much as I would like to write about 10,000 horror movie reviews all on my own, that ship has already sailed. To be honest, I'm getting bored with writing about horror movies when I'd much rather just be watching them.